Two new reports by the European Environment Agency (EEA) shows that air pollution in Europe has a high economic and human cost. According to the agency, air pollution has caused premature deaths, damaged buildings, and reduced agricultural yields. It’s estimated that damages from air pollution between 2008 and 2012 could cost society as much as €1053 billion. Air pollution in Europe cost society up to €189 billion (about US $235 billion) in 2012 alone, the European Environment Agency (EEA) said in a new assessment report. Over the period 2008-2012 the estimated cost was at least €329 billion and possibly up to €1053 billion. 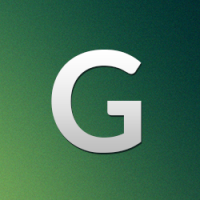 The greenhouse gases and air pollution from Europe’s industry mainly comes from coal-fired power plants located predominately in Germany and Eastern Europe. 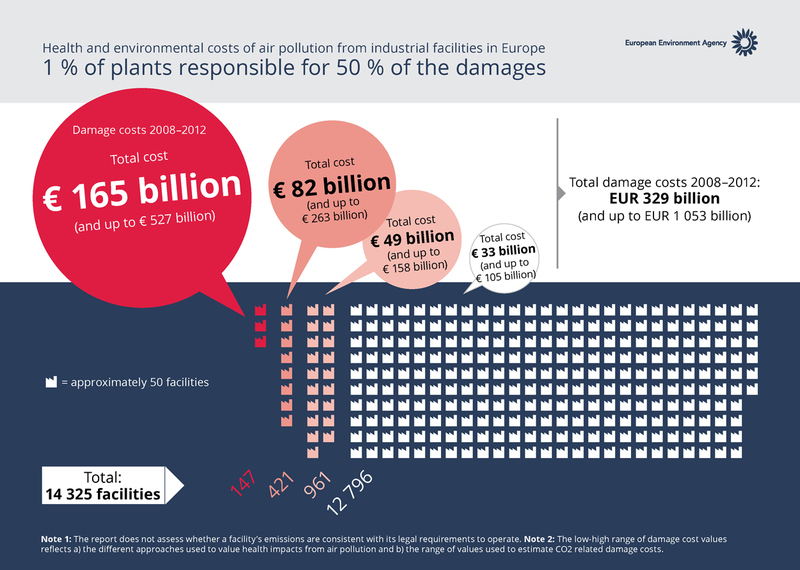 The majority of the damage costs between 2008 and 2012 were caused by just 1 percent of Europe’s industrial facilities. The EEA research show that 26 of the top 30 industrial facilities that are polluting the worst and causing the highest damage are power-generating facilities which are primarily fuelled by dirty coal and lignite. 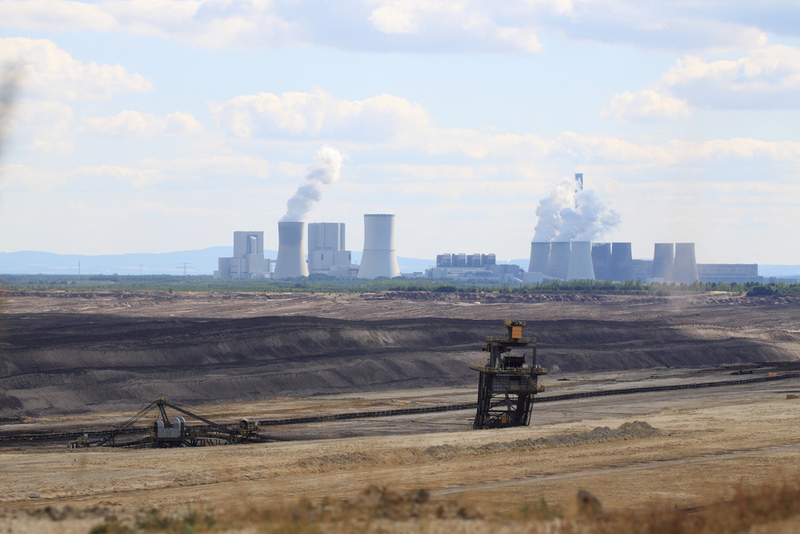 Eight of the top 30 facilities are located in Germany and six are in Poland – two countries that rely heavily on coal. Germany and Poland are followed by Romania which has four of the dirtiest facilities; three are located in Bulgaria and the United Kingdom, two are in Greece; and the Czech Republic, Estonia, Italy and Slovakia all have one each. The combined cost for air pollution in Europe is equal to the gross domestic product (GDP) of Finland or half the GDP of Poland – a country which has opposed tougher EU and IPCC climate targets. 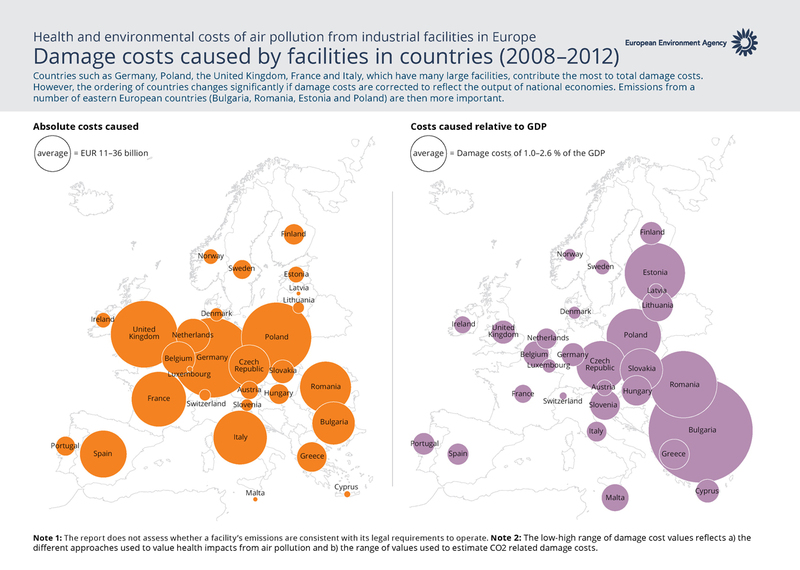 The EEA calculated the costs of air pollution on health costs, damage to buildings, reduced agricultural yields, lost working days from sickness caused by air pollution, among other things. Another EEA report released earlier this month calculates the human costs of air pollution in European cities. The study show that while various policies have indeed improved air quality overall, air pollution continues to be a major environmental health hazard in Europe. EEA calculates that air pollution is responsible for causing workers to go sick, resulting in higher costs for health care systems. According to the environmental agency, air pollution is responsible for an estimated 400 000 premature deaths in Europe in 2011. "Air pollution is still high in Europe," EEA Executive Director Hans Bruyninckx said. "It leads to high costs: for our natural systems, our economy, the productivity of Europe’s workforce, and most seriously, the general health of Europeans." The two reports from EEA will come in handy for EU policymakers who are currently reconsidering proposals to tighten air pollution laws put forward last year by the former European Commission. According to documents obtained by Reuters, the new conservative European Commission, led by Jean-Claude Juncker, is considering to weaken or even scrap these proposed new air quality laws.